Sorry, you can only order up to 27 units of this product! The Affine Bordeaux range offer a designer-inspired collection of bathroom suites that have clean curved shape with gentle angled profiles that will fulfil all of your bathroom aspirations. Bathroom suites should be where you can relax and this suite certainly inspires calm! The stunning Affine Bordeaux Toilet combines modern styling with complete comfort to present you the perfect family friendly toilet! Featuring a dual-button which allows you to choose between two practical functions of a high and low flush volume which means you will benefit for a highly efficient toilet – promoting the conservation of water by reducing waste liquid. Not only does this toilet bring supreme efficiency to the table but it looks fantastic too! 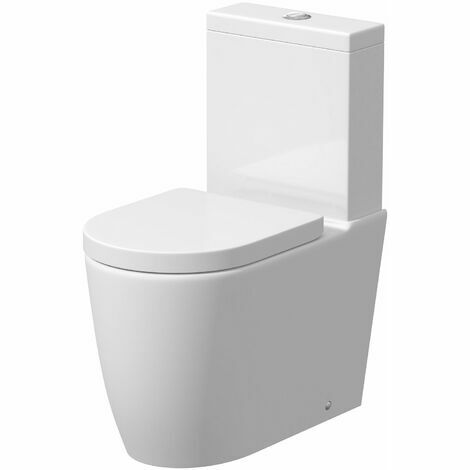 This close coupled toilet includes an angular cistern which helps to promote its contemporary looks. And that's not all! The WC also features a luxury soft close toilet seat which not only is it super practical but it's an extremely comfortable solution. The slow and silent closing process prevents damage to the ceramic of the pan – in the long, it reduces wear and tear on the seat itself. Very modern looking toilet for a great price!